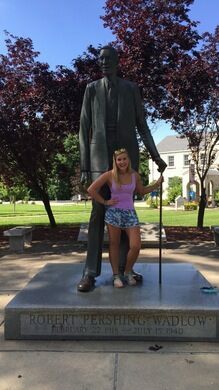 Robert Wadlow suffered from an overactive pituitary gland which caused him to grow to a height no other person has ever reached and his one-of-a-kind presence is remembered with a bronze statue in Alton, Illinois. Odd, decrepit fountain honors Chicago author who had mixed feelings about his hometown. 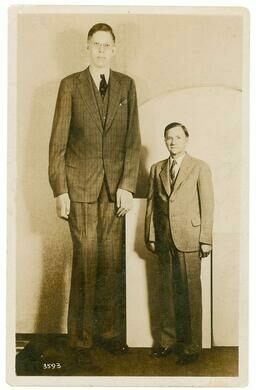 Also known as the “Giant of Illinois” or the “Alton Giant,” Wadlow began growing early on, growing past seven feet tall when he was still a teenager. He would continue to grow throughout his tragically short life and at the time of his death (at the young age of 22), he stood a towering 8’11 and weighed over 400 pounds. Wadlow had maintained good health in his life but often had little feeling in his feet, which would sadly be his downfall. Unable to feel his feet chaffing until wounds formed, one such wound became infected and ended up poisoning his entire body. During his brief life, Wadlow managed to garner a fair amount of celebrity and his funeral was attended by tens of thousands of admirers. His body was returned to Alton and buried in a solid concrete grave to avoid any tampering. 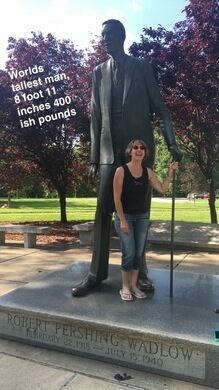 The city of Alton installed a permanent homage to the man in 1985 with a life-size Robert Wadlow Statue which remains today. Visitors can now step right up to the world’s tallest man and feel just what its like to stand in the shadow of a legend. 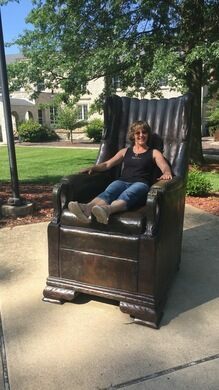 The statue was sculpted in the early 1980’s by then graduate student Ned Giberson at the Southern Illinois University in the nearby town of Edwardsville. Today the statue stands directly across the front door of the main campus of Southern Illinois University School of Dentistry. First known as the "Sample House," this construction mash-up was meant to be a living catalogue of building styles. A wax effigy of St. Valentine hides one of the saint's relics. A monument commemorating the role of Alaska's native Tlingit guides in the Klondike Gold Rush.